Something that is viable to do if you don't have sharpening facilities handy is to occasionally touch up the cutting edges of the shears by hand with an oil stone. You need an oilstone that you can pick up by hand and something like a table edge to rest the opened blade on. 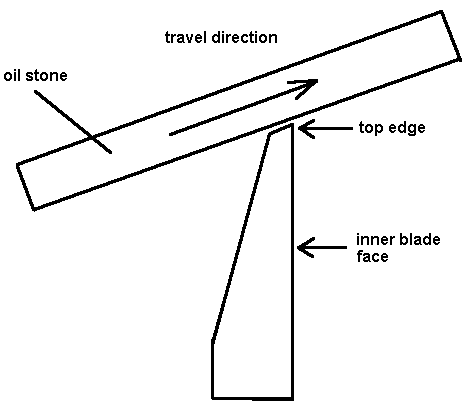 The diagram above shows you the basics of how to touch up a blade that is just starting to go blunt through normal wear. Open the blades up far enough so you don't risk nicking the other blade then rest it on something that is stable enough like a table edge, a slightly opened vice jaws or whatever takes your fancy then carefully observe the angle of the top edge. With the oilstone move it from the outside of the blade across the cutting edge towards the inside face while intentionally going ACROSS the blade, not inline with the blade. You will know when the blade edge is correct as you drag a fine burr on the inside face that you can feel with your thumb. Just be careful that you don't cut yourself testing this. Once you have the edge done slightly push the tips apart and close the shears. This is important because you risk gapping the edge if you just close them normally with the inside burr. When the blades are closed hold the tips together and open the shears so that any burr is dragged up. Do this a number of times until you cannot feel the burr on the inside face then carefully try closing the shears in the normal manner as if you are cutting fabric. What you are after here is a fine line that is almost microscopically fine that the two blades run against. You can usually see it in very bright light on the very top edge of the inside face. The reason why you sharpen across the blades is so you maintain enough scratch pattern to grip the fabric as you cut it so it does not slip forward while cutting. It is also important to try and maintain the existing angle on the top cutting edge so that the shears maintain the same cutting characteristic.